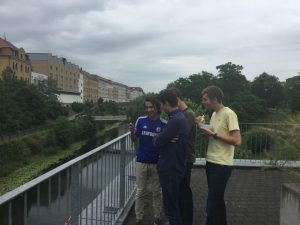 COBA students studying abroad in Leipzig, Germany, continued their coursework and site visits this week. 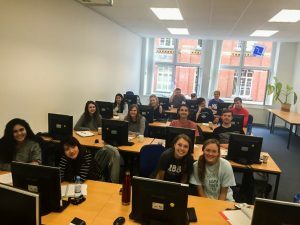 Pictured below is the group on a typical Thursday morning sitting in a Financial Management class from 9:00 am – noon in Leipzig. During breaks, the group has met and had the opportunity to visit with refugees from Syria and Iraq. The refugees are taking an intensive German class so they can live and work here in Germany. 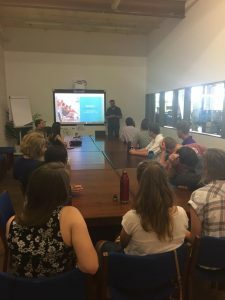 Wednesday, the group went to Social Impact Leipzig, an early-stage incubator for social entrepreneurship ventures. Their host was Jennifer Pauli. She showed the group around the location, which is primarily shared office space for firms that are participating in the incubator program. Then they heard pitches from some of the firms that are currently in the program. One of the pitches was given by Mike from Night Bank. His firm is similar to AirB&B, but with a socially minded twist. People with unused rooms donate them to Night Bank for a specified number of nights. Night Bank books tourists and guests in the rooms and charges them a fee. Night Bank then uses 90% of the fees they collect to support aid projects around the world. One recent project was a water collection tower in Kenya. The person who donates their room to rent gets to select the project they would like their fees to support. We’ll continue to blog about the adventures of our group in Leipzig as their time starts to wind down and another group travels to Asia. 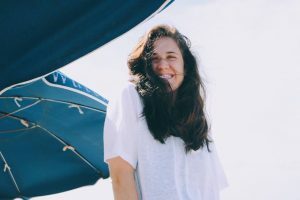 Keep checking back and share this blog with your friends! 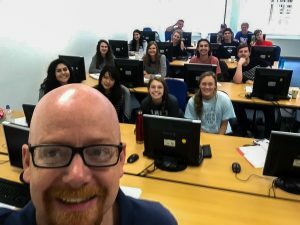 COBA offers students opportunities every summer to visit the world, earn course credit, and learn about international businesses by touring companies in host countries. 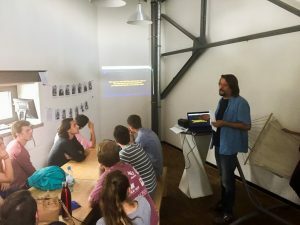 This summer, we have students in Leipzig, Germany with Dr. Jonathan Stewart. 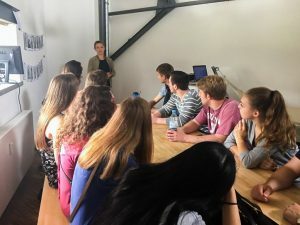 In addition to coursework, this week students were given a video assignment while visiting Luma Lenscraft, a video production company in Leipzig. 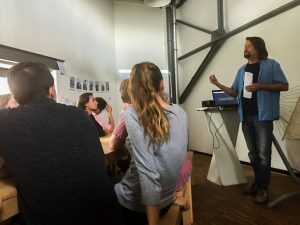 COBA’s hosts at Luma Lenscraft gave a short video workshop, taught students about translation services in Europe, and asked the students to create a one minute video about their time in Germany. The assignment was to shoot the entire video on a smart phone in a single shot. Luke Stevens, Taylor Spencer, John Baker and Lincoln Jones working on their video assignment. Mackenzie Dalton, Addy Taylor, Hunter Hays, and KayAnn Orr working on their video assignment. 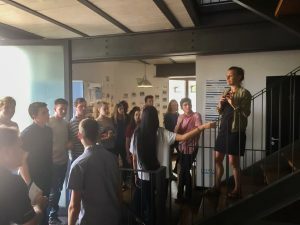 Students also visited SpinLab. 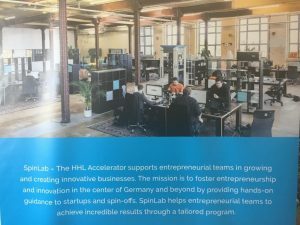 SpinLab is a startup incubator based in the old Spinnererei district of Leipzig and at one time, was a hub for cotton markets in Germany in the early and mid-1900’s. The group first heard from Shawn Segundo, Online Marketing and Event Manager. He explained how SpinLab hosts 12 startups per year. Two of the twelve made their pitches to the COBA group, Shark Tank style. The first pitch came from Andreas Dunsch of FlyNex, a drone services company that provides start to finish drone services and data analysis. The second pitch was from Sebastian Leppert of OKIKO. OKIKO is an online payment systems providing safe and intuitive payment options for children, ages 7-17. 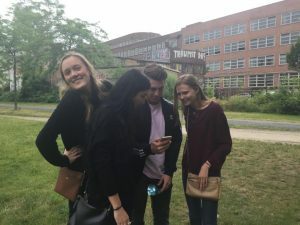 It was an educational and enlightening trip and we want to thank our hosts at Luma Lenscraft and SpinLab for welcoming our students. Check back with us for updates from Leipzig as students visit Red Bull Arena and Porsche next week.